Jewelry made from paper beads is a paper craft that is quite popular today. The art of paper bead crafting, however, has been practiced since the Victorian age. Women would gather together and make paper beads from leftover wallpaper. Their craft techniques were quite simple. After they rolled and glued the paper beads, the beads were then coated with beeswax and strung together to make beaded curtains and room dividers. Today people craft paper beads primarily to make jewelry, which can be surprisingly elegant and beautiful. Paper: leftover magazines, scrapbook paper, junk mail, wallpaper, washi paper, copy paper, hand colored paper, etc. Place your paper face down. Using a ruler and pen or pencil draw your bead paper template shapes onto the back of the sheet of paper. Cut the paper bead template with a craft knife, ruler or scissors. Use the drawing above as a reference for making, cutting and rolling round paper beads. Place a toothpick or bamboo skewer on the long edge of the paper triangle. Use tacky glue to attach the toothpick to the end of the paper bead triangle. Roll the end of the triangle towards the pointy edge and secure the end with tacky glue or a glue stick. Place the toothpick into a piece of floral foam or styrofoam and allow the glue to dry. If you like, you can use a marker or craft paint to color the ends of the beads. Place aside until you are ready to seal and coat the beads. The shape of the paper bead depends on upon the form of the paper bead template. 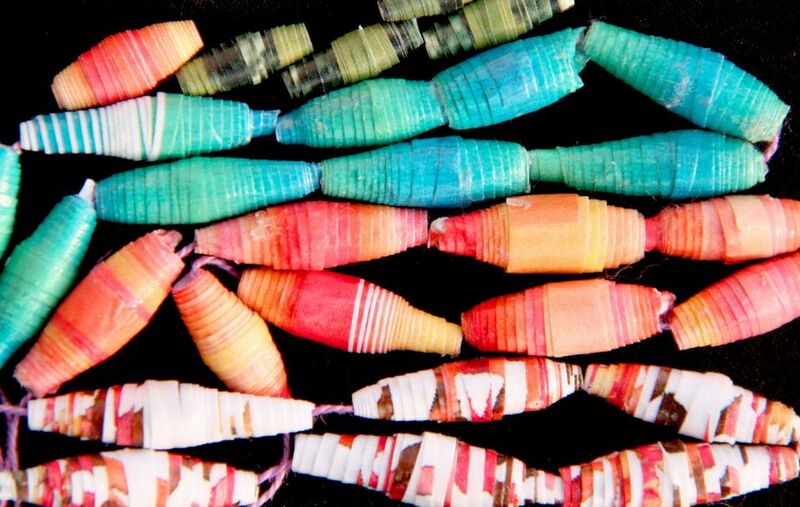 Make tubular shaped paper beads from rectangular pieces of paper. Use the above photo as a guide when crafting long cylindrical paper beads. Construct teardrop beads from right triangle shapes of paper. The next step after the tacky glue has dried, and the edges of the beads are colored, is sealing and coating the paper beads. There are many types of products out there that people use, such as mod podge, marine varnish, and clear nail polish. My personal favorite is a fantastic product called PC-Petrifier Wood Hardener. Pc-Petrifier is used to harden rotted wood on decks and outdoor furniture. Paper beads become rock solid when dipped in this product. Always use caution to cover your hands with latex or rubber gloves and avoid getting the product close to your mouth. The first step is to remove the toothpick or bamboo skewer. Place a piece of plastic sheeting onto your table to protect it. String your paper beads onto a piece of thin wire and then dip them into the PC-Petrifier solution. Let them soak for a little while and then hang to dry. After about an hour dip them into the solution again and once again hang them to dry. The beads will not stick to the wire or each other with the PC_Petrifier solution. The beads will now be rock solid and shiny! PC-Petrifier Wood Hardener is undoubtedly the best product I have found for bead making, but some people prefer using the other products mentioned above. The choice is yours based on your preferences. Use paper beads to make bracelets, earrings, necklaces and other various projects. I have even seen purses made with paper beads! Who would have believed that? If you don't know what to make with your paper beads, or how to proceed, to take a look at the following links for some paper bead crafting inspiration. How to Make a Stunning Paper Bead Necklace The necklace is constructed from beautiful black paper beads, silver jewelry balls, and silver tubing elements. A Paper Bead Craft Project Roundup 17 paper bead craft projects are featured for your crafting inspiration. If you need even more inspiration, you will find thousands of beautiful paper beads on Pinterest and Instagram.